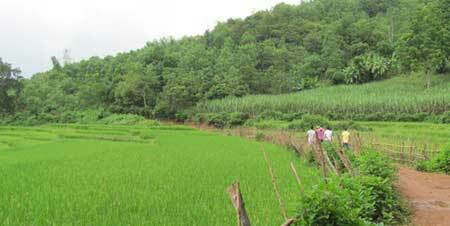 Ethnic people living in Tu Ne – a rural commune of Tan Lac District in the northern mountainous province of Hoa Binh, have launched an impassioned project to turn their picturesque land into a tourism hotspot. Nimble feet: Ethnic local people present their traditional dance mua sap. Sweet scene: A tourist tries some farming work in a sugarcane field. Nestled in the peaceful countryside with lush rice paddies and sugarcane fields bordered by limestone mountains, the region is home to a large number of the Muong ethnic group. The Muong’s centuries-old culture still remains a big part of the community and is reflected in many fields of local life. 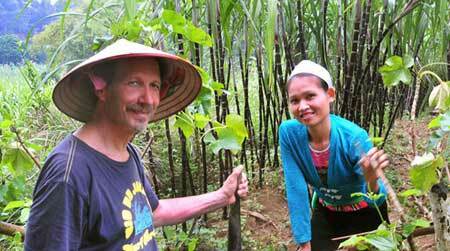 Realising the advantages of this, the Centre for Environment and Community Assets Development (CECAD) in collaboration with Ha Noi-based HG Travel, has implemented a community-based tourism project, focusing on the traditions of local Muong people. A component of a CECAD capacity building project in the region, the project strictly follows sustainable and community concepts, being eco-friendly and operated exclusively by local ethnic people. Under the project, ordinary people familiar with traditional farming methods, have been trained to exhibit serviced-oriented behaviour. “In turn, the community will have the chance to communicate with people from many different cultures from around the world and increase their income,” said vice director of CECAD, Le Thi Van Hue. From March to June, and September to November, visitors can explore the stunning scenery of ripe rice fields. If they want to experience how hard the farming work is, they can join the local people to harvest rice or load it onto carts. By following the trail passing through the village, visitors can reach a tranquil lake, where – provided they don’t mind sharing the water with bulky buffaloes – they can swim in the cool water or row a boat around the lake. Depended on the season when tourists visit Tu Ne, they can have the chance to join different cultural and spiritual festivals of the Muong people, including the khuong mua (xuong dong or starting a new rice crop), the pon poong (flower appreciation) in spring and the mung com moi (new rice welcoming) in the 10th month of the lunar calendar. Other significant traditional fetes include housewarmings, weddings and funerals. While walking around the village, tourists can sample any Muong traditional – from life in stilt houses to weaving sophisticated brocade cloth or learning how to create homeware and farming tools from bamboo. Alongside farming, bee feeding is another major source of income for local people. Tasting their pure honey, a speciality of the region, is another must do for tourists. After a long walk, visitors can refresh by sipping a glass of sugarcane juice. If they want, they can follow a local to pick sugarcane from his farm and then prepare their own fresh drink. If sugarcane juice is not enough to refresh tourists, they can then try the herbal foot bath – a very effective method to chill out and relax. Sampling local food is another great way to experience the culture. Visitors will be able to enjoy meals with local people featuring typical Muong dishes prepared from locally-harvested ingredients. When night falls, local women will change from their humble costumes into traditional brocade dresses to present a traditional art performance for tourists. For those who want to stay overnight, they can choose one of four stilt houses to sleep in. By visiting Tu Ne, visitors not only have the chance to gain a deeper understanding of local authentic culture, but can also enjoy its unspoiled natural scenery. Furthermore, their visit will help the sustainable development of the area. For those seeking a new destination off the beaten track, Tu Ne is a promising place. “Tu Ne is exactly like Mai Chau [another ethnic region in Hoa Binh Province where has a successful grassroots tourism project] 20 years ago. I believe the region will become another tourist magnet in future,” said a Vietnamese visitor decisively. To learn more about the region as well as its community-based tourism, visit tunecbt.com.